Hubert Renfro Knickerbocker (January 31, 1898 – July 12, 1949) was an American journalist and author. He was nicknamed "Red" Knickerbocker from the color of his hair. A son of Rev. Hubert Delancey Knickerbocker, H. R. Knickerbocker was born in Yoakum, Texas. He graduated from the Southwestern University in Texas, then studied psychiatry at Columbia University before becoming a career journalist who won a Pulitzer Prize. 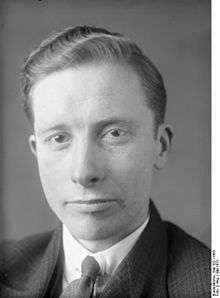 Knickerbocker was noted for reporting on German politics before and during World War II. From 1923 to 1933 he reported from Berlin, but because of his opposition to Hitler he was deported when Hitler came to power. Back in America, he continued writing about the threat posed by Nazism. On April 15, 1933, he wrote in the New York Evening Post: "An indeterminate number of Jews have been killed. Hundreds of Jews have been beaten or tortured. Thousands of Jews have fled. Thousands of Jews have been, or will be, deprived of their livelihood." In 1931, as a correspondent for the New York Evening Post and the Philadelphia Public Ledger, he won the Pulitzer Prize for "a series of articles on the practical operation of the Five Year Plan in Russia". After World War II, Knickerbocker went to work for radio station WOR, in Newark, New Jersey. He was on assignment with a team of journalists touring Southeast Asia when they were all killed in a plane crash near Bombay, India, on July 12, 1949. Knickerbocker was married first to Laura Patrick in 1918, and they had one son, Conrad, later a daily book reviewer for the New York Times; his second marriage was to Agnes Schjoldager, and they had three daughters. He plays a cameo role in Erik Larson's non-fiction 2012 book, "In the Garden of Beasts: Love, Terror, and an American Family in Berlin." ↑ Preston, Paul (2009). We Saw Spain Die: foreign correspondents in the Spanish Civil War. Skyhorse Publishing, Inc. p. 33. ISBN 978-1-60239-767-5. ↑ Walter Prescott Webb, Eldon Stephen Branda, The Handbook of Texas vol. 3 (1952), p. 482: "Hubert Renfro Knickerbocker, internationally known writer and Pulitzer Prize-winning journalist, was born in Yoakum, Texas, on January 31, 1898, the son of Rev. Hubert Delancey and Julia Catherine Knickerbocker..."
↑ "KNICKERBOCKER, HUBERT RENFRO". TSHAOnline. Retrieved 2013-10-31. ↑ "The Pulitzer Prize: 1931 Winners". The Pulitzer Prizes. Retrieved Mar 9, 2010. ↑ Larson, Erik (2011-01-01). In the Garden of Beasts: Love, Terror, and an American Family in Hitler's Berlin (1st ed.). Crown. ISBN 9780307408853.